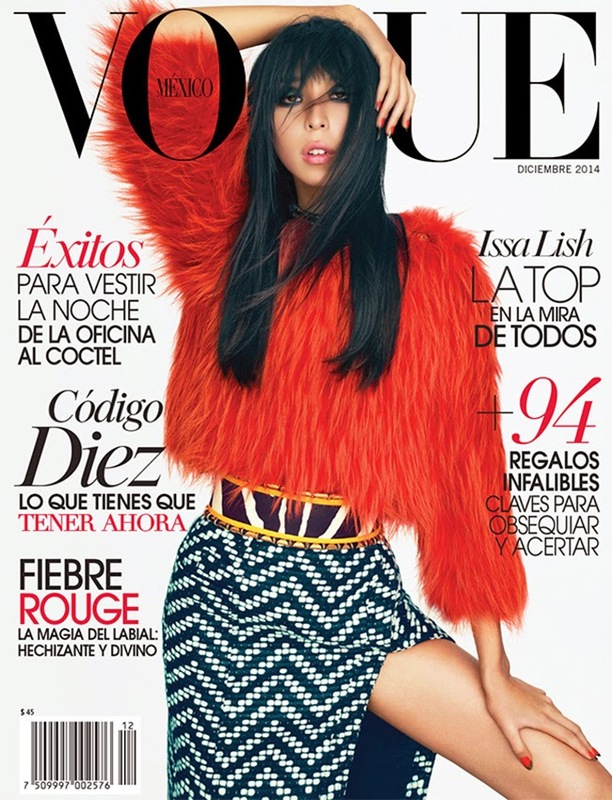 Mexican Japanese newcomer Issa Lish caps off a momentous year with a cover and editorial appearance for Vogue Mexico's December 2014 issue. The eighteen year old model of the moment strikes a pose for photographer Alexei Hay for the high glam shoot decked out in looks styled by Sarah Gore Reeves from the Spring/Summer 2015 Balmain collection. Represented by Muse Model Management in New York, Lish was initially discovered by a friend of her mother agent Mau Medellin while waiting tables in her father's restaurant as punishment for making bad grades that semester. Upon graduating high school, Lish committed herself to modelling full-time and joined modelling's major league following a controversial cover appearance for Vogue Italia lensed by Steven Meisel with the subject of domestic violence being the story's focal point. Lish has since gained considerable momentum with blue chip campaign bookings for Balmain and Coach lensed respectively by Mario Sorrenti and Meisel. At the recent Spring/Summer 2015 collections, Lish amassed 26 pristine show bookings including Miu Miu, Prada, Marc Jacobs, Alexander McQueen, Chanel, Bottega Veneta, and Céline. Editorial appearances for Love, Dazed & Confused, and Numéro China, in addition to a second cover appearance on Vogue Italia's epic 50th Anniversary issue reaffirm Lish's status as fashion's newest darling.